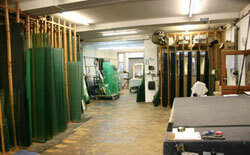 We are very proud to have our glassworks running side by side with our installation department. The Glass Centre workshop was established in 1966. Over the years we have gained a very loyal following of the city’s local builders. Our glaziers are fully trained, accredited and very friendly, always on hand to assist you with your requirements and offer a fully comprehensive fitting service with FREE local delivery.